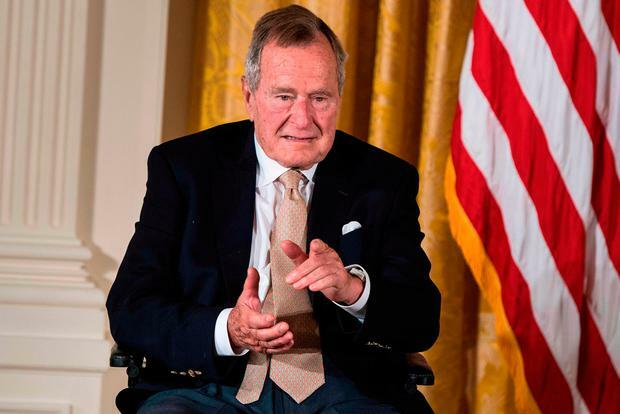 George HW Bush died surrounded by family and friends after a last meal of eggs, yogurt and fruit juice as Irish tenor Ronan Tynan sang 'Silent Night' at his bedside, it has emerged. According to James Baker, his best friend and secretary of state, who was with the former president at the end, it was "really a very, very gentle and peaceful passing for him". As the Bush family prepared to send his body to Washington DC today to lie in state in the Capitol's rotunda before a national day of mourning on Wednesday, Mr Baker said his friend had come to terms with his imminent death. When Mr Baker arrived at the family home in Houston, Texas, on Friday morning, Mr Bush told him that he wanted to go to heaven. He told the 'New York Times' that the 94-year-old asked him: "Where are we going, Bake?" to which he replied: "We're going to heaven." "That's where I want to go," said Mr Bush. Although Mr Bush's condition had deteriorated during his final two weeks, on Friday he seemed to perk up. He enjoyed three five-minute soft-boiled eggs, a bowl of yogurt and two fruit drinks. Later Mr Tynan, a close friend of the Bush family, called in and was asked to sing. He chose 'Silent Night', and as he sang, Mr Bush mouthed the words to the Christmas carol. It was followed by an Irish song.